This diagram illustrates where extract (i.e. 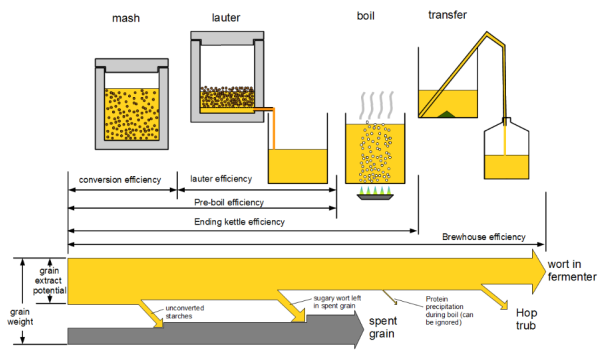 efficiency) is lost starting with the grain and ending with the dissolved extract in the fermenter. Conversion efficiency is based main on mash temperature, crush, mash thickness, and pH. Efficiency is not constant for a given brew rig. Efficiency is constant for a given brew rig and a given recipe. For higher gravity beers, more grain is used, hence there is more grain absorption and lower efficiency. The same is true for hoppy beers – more hops leads to more hops absorption, and lower efficiency. Brewing practices can mitigate this to some extent. How is efficiency calculated in a Brew Session? How is efficiency defined on the recipe editor?